Create a real Cathedral experience with a warm glow throughout your home with Bright Glow Candle Company's Authentic Sanctuary Collection Prayer Candles. As the candle burns, you will experience beautiful, warm candle light as found in authentic prayer chapels and sanctuaries. 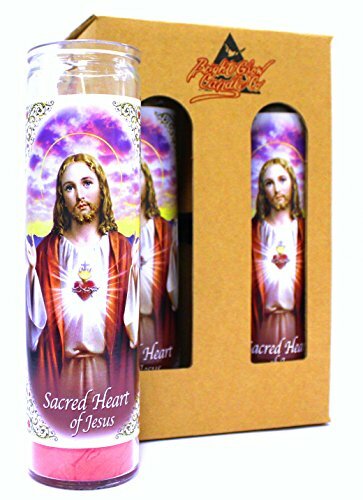 Our Prayer candle highlights the Guardian Angel on the front and a prayer to the Guardian Angel on the back written on both English and Spanish. Bright Glow Candle Company's Devotional prayer candle is perfect for a prayer alter, mantle piece, or for any room in your home. • Made with love in the USA by Bright Glow Candle Co. Burning Instructions: This product is designed for continuous burning once lit. If lit candle is extinguished, make certain it stays lit until the wax is completely liquified across the top of the glass. Keep candle within sight and out of the reach of children or pets. Never burn a candle on or near anything flammable. Trim wick to 1/4 before each lighting. ✞ For use in Novena, Candleight Vigils, Sanctuary and Spiritual practice. Manufacturer: Bright Glow Candle Co. Brand: Bright Glow Candle Co. Publisher: Bright Glow Candle Co. Studio: Bright Glow Candle Co. If you have any questions about this product by Bright Glow Candle Co., contact us by completing and submitting the form below. If you are looking for a specif part number, please include it with your message.